On a gloomy, chilly afternoon recently I headed off to Salisbury to visit a garden I have been keen to see for ages. Tucked away in the grounds of Salisbury Hospital, between Car Park 8 and Car Park 10, is the wonderful Horatio’s Garden. 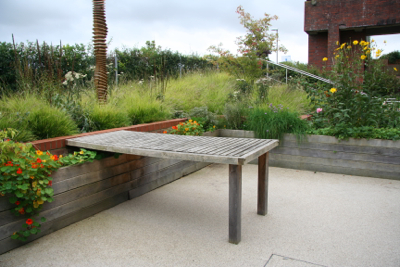 Built for patients of the Duke of Cornwall Spinal Treatment Centre at the hospital, the garden is named after Horatio Chapple who volunteered at the centre and recognised the desperate need for an outdoor space for patients (who can be at the hospital for as long as 12 months). 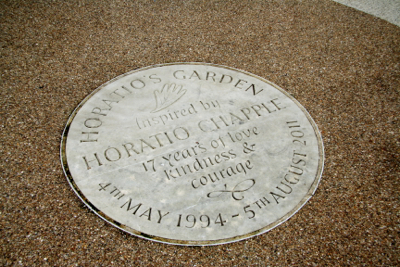 Horatio was tragically killed aged just 17, but the garden is a fantastic memorial to him and to his efforts at creating a beautiful garden for patients and their families to enjoy. The garden was designed by Cleve West (a stalwart of the Chelsea Flower Show and an inspirational British garden designer). It opened in 2012 and has won many awards, and deservedly so in my opinion. The key features of the garden are the curving spine-like dry stone walls which run through the garden – some complete, and some broken. These walls double as seats too, creating a low-key sociable space. 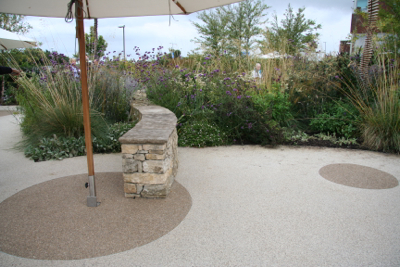 The ground has been levelled and surfaced in resin-bonded aggregate which provides a smooth porous surface – very practical for patients in wheelchairs. 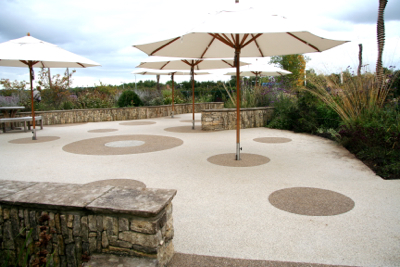 There are intimate seating areas, and shade provided by parasols, with a large open central area which is ideal for patients and families to gather for events. 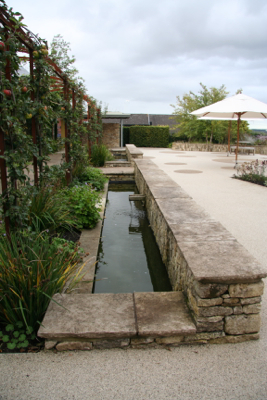 Water falling into a long stone rill creates a calming sound, and the enormous rusted steel archway tunnels are planted with Wisteria and apple trees. A summer house in the corner offers more shade and a quiet space to enjoy views through the garden. The planting is very soft and airy, predominantly herbaceous and ornamental grasses, with views through the beds to other areas of the garden. Trees such as Amelanchier and Birches are scattered through the planting areas too. The garden is enclosed with hedging making it feel like it’s a world away from the hospital environment. 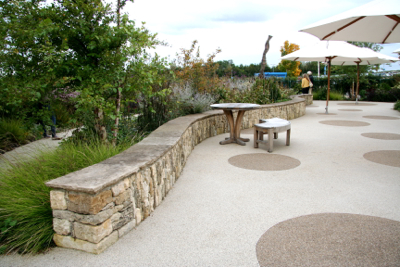 But it’s not just a space for quiet contemplation – this garden is used regularly for social and artistic events, and fund-raising activities. It is very much a space for enjoyment, as well as a place for patients and visitors to find some peace and quiet. An additional area with a greenhouse and specially-designed planters and potting spaces mean that the patients can also get involved in growing plants for the garden and to raise funds. This summer there were six fantastic Oak sculptures in the garden, on loan from the artist Johnny Woodford. 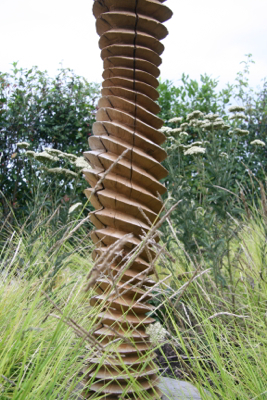 Up to 4 metres in height and reminiscent of the form of a spine, they fitted into the garden brilliantly. With studies showing that a hospital patient’s well-being was improved when they had a room facing trees, you can imagine what a huge difference being able to get outside into such a beautiful calm space must make to the patients in Salisbury. 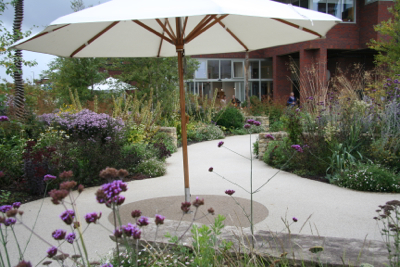 In fact this garden has been such a success that there is to be another Horatio’s Garden at the Scottish National Spinal Injuries Unit in Glasgow – this time to be designed by James Alexander-Sinclair. And following Glasgow will be another garden at Stoke Mandeville Hospital which will be designed by Joe Swift. As someone who can’t sit still or bear to be cooped up inside for any length of time, I can’t really imagine what the patients at these spinal units are going through. And that’s why I think Horatio’s Garden is such a fantastic cause. If you’d like to learn more about (and support) the charity, then click here. The Salisbury garden is open to the public occasionally and details can be found on the website.